"I paint the skies with peace and passion, because that's the way they paint me." All this and a duck race too. 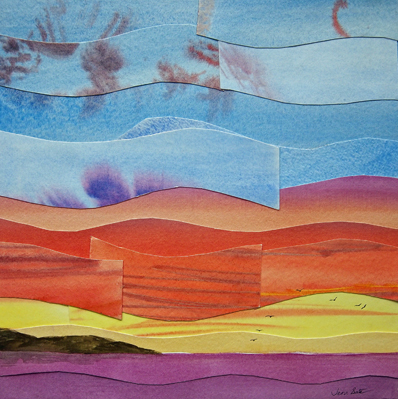 On Wednesday evening I ran one of the watercolor collage classes at the Yuma Fine Art Center in Yuma, AZ. (This is my first out-of-state class!!) The Art Center had advertised very well and I had a class of fourteen. All gals! As always, there was a huge range of ideas and uses of the watercolor pieces before them – inside the box thinkers – outside the box thinkers – box? what box? thinkers – rippers -cutters – open spacers. I figure I always learn something from a class, and this time it was to make a longer thinner table for large classes so it’s easier to get at the pieces – and to take a couple photos of the class in case my phone doesn’t focus! So in the grand scheme of integration of all social media platforms, I’ve yet to master having my mailchimp newsletters feed to my wordpress blog, so here’s this month’s newsletter, manually. Happy, healthy, prosperous and colorful 2016! It’s been a while since I’ve made the trip to the Yuma Art Center to restock in their gift store, Artistically Inclined – but tomorrow is the day, and it looks like I’m going to be blessed with slightly cooler weather for the trip, seeing as it is getting quite toasty here. #1096 The Heron’s Nest. 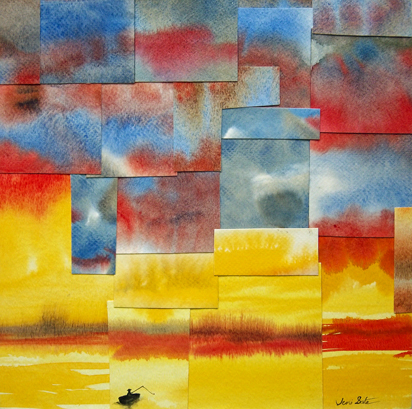 Watercolor collage on flat panel, 12×12″ $180. 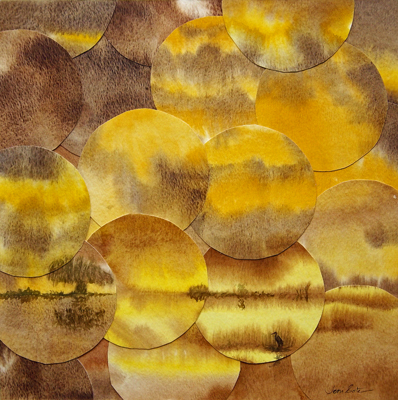 I have three new watercolor collages on panel that I’ll be taking, and quite a few new small acrylics (the ever popular 4×4″ ones) and I know they ran out of The Skies of Peace and Passion a couple of months ago. The 4×4″ acrylics are at the end. I can’t get the canvases at a price that allows me to sell them at $20, so this is the last batch. I still have some though for the next few shows where I’ll show acrylics and oils. Today it’s cloudy – I’m wondering if we’ll get an interesting sunset…. it’s been a while since I’ve seen a sky here that’s been worth the shot! Sadly though, no hope of rain. In the studio – I’m in progress on a refractured watercolor that will be going to Maturango Museum in Ridgecrest next month. 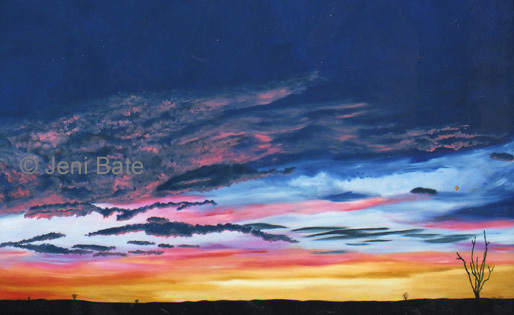 “Wave Crest” – 9×20″ refractured watercolor on float panel. $225. I love the drive to Yuma – through desert, fields, desert and winding back and forth across the All American Canal. I also enjoy my art restock in the Yuma Art Center Gift Store, which I do about every three months. This time Catherine chose four of the new “Thought in a box” boxes and a few of the very latest, including ‘Wave Crest’. Wave Crest is one of those born of a happy accident. It reminded my that some friends who have known me since before I started painting seriously comment that they can’t even draw a straight line. Well the crest of that wave happened because of me not being able to paint a straight line all the way across the page. While I was waiting for Catherine to complete the paperwork I was able to look around the show currently in the gallery. I’m often intrigued by techniques I haven’t seen or tried before. The ‘dribble’ run of oil paint down a canvas confirms what I suspected about being able to paint oil as wet-in-wet. The use of alcohol inks on steel make me want to try those. The work of on Glenda Jackson with poetry and painting on and within boxes sure resonated. I asked Catherine if she was going through a ‘box’ period of her curatorship.